Mars’ Sustainable in A Generation programme covers the environmental impacts of their direct operations including more than 400 facilities globally. As part of this program, Mars manages a global portfolio of renewable energy projects in conjunction with efficiency work led by the business units. These are smart kids – but like all children, they have a somewhat simplified understanding of how the world works – so I told the story of what I do through the lens of just one of the products we make – DOVE® Promises with Almonds. I talked about water stress in California – the home of most of the world’s almonds. I talked about the global supply chain behind the aluminium foil wrapper – and the energy it takes to make aluminium and that can be saved by recycling it. 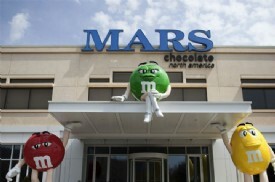 I talked about using renewable energy in the factory that makes the chocolate and the wind projects we’ve done at Mars. It was a success (according to the key stakeholder involved – my son) but the most interesting reflection for me was that the exact same story would have been appropriate for almost anyone who wasn’t already a full time sustainability professional. As our economy has gotten more complex, fewer and fewer of us actually understand what the supply chains that makes our lives possible look like. Fewer still understand how they work or the risks they face. A few hundred years ago when most of us grew our own food, we were very aware of the start of a drought or the consequence of a badly timed hail storm. Today we rarely even know where the food we eat comes from, let alone how changes in weather and climate will affect it. If we’re going to prevent the worst consequences of climate change and deal with the ones we’re already facing, we need to share what we’ve learned with as wide an audience as possible. If we only speak about climate change to fellow sustainability professionals, we run the risk of leaving behind the rest of the business world, our political leadership and the public at large. Some problems become obvious quickly and can be corrected just as quickly – if you get thirsty, you drink some water – problem solved. Climate change isn’t one of those – the feedback loop is too slow. Greenhouse gas emissions that have already gone up will drive change for decades into the future. And reducing emissions isn’t as simple as drinking a glass a water – it takes time to develop new products, build wind farms, teach farmers new techniques, and change laws. If we are going to achieve global change we need to reach the mainstream. They need to know that climate change isn’t just about the environment – it’s about the welfare of people and the success of our businesses. Risks and opportunities driven by climate are also risks and opportunities for humans and business. We can’t speak only to people we identify with, who also work in the fields of climate change, sustainability, or responsible business. It is our job to help inspire the right actions in as many people as we can, otherwise we will always be preaching to the converted. And we can start with the business sector, where great leaps have already been made. At Mars we have a strong story that we can tell that contributes to this conversation. We are already taking many steps forward across the Mars business to bring down our impact on the environment. We signed a letter with 1000 other businesses and investors under the banner ‘Low Carbon USA’ calling on the U.S. President and others not to abandon the Paris pledges and to invest in the low carbon economy. Moreover, for this year’s Earth Day, Mars shared educational videos to help spread the climate change message, tying in with the theme of ‘Environmental and Climate Literacy’. And we are not the only ones. The number of companies that have signed up to RE100, a pledge to be supplied by 100% renewable electricity, has grown from three to 94 in just three years. And as well as Mars, more than 100 companies, including tech giants Apple, Google, Amazon and Microsoft, called for action on the Clean Power Plan to reduce emissions in the energy sector. We are firmly convinced of the science behind climate change and one of our core principles at Mars is sustainability. We’re already seeing the economic benefits of going green, whether it’s improving our supply chain or working with more environmentally conscious suppliers. If we as a business community follow the guidelines over the next three years issued by the UNFCCC (United Nations Framework Convention on Climate Change) – namely, to ensure that large-scale deforestation is replaced by shifts to earth friendly practices, and that renewables outcompete fossil fuels as new energy sources worldwide, and relay these successes to an audience beyond sustainability professionals, then we can leave my son, his classmates and their generation the world they deserve.